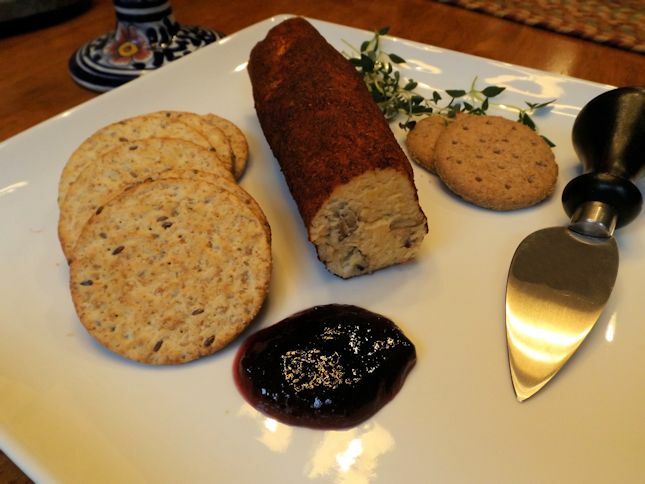 Apparently I am the last person on earth to make this cheese log. Last week you recall I was going through my old recipe boxes to play Recipe Box Roulette. While inside those yummy vintage files, I found a recipe for Chili Cheese Log. I thought I had stumbled upon some rare long-lost recipe from the files of my ancestors. Not so much…I Googled the recipe only to find 20,000 variations. I made it anyway even though it isn’t rare or unique. 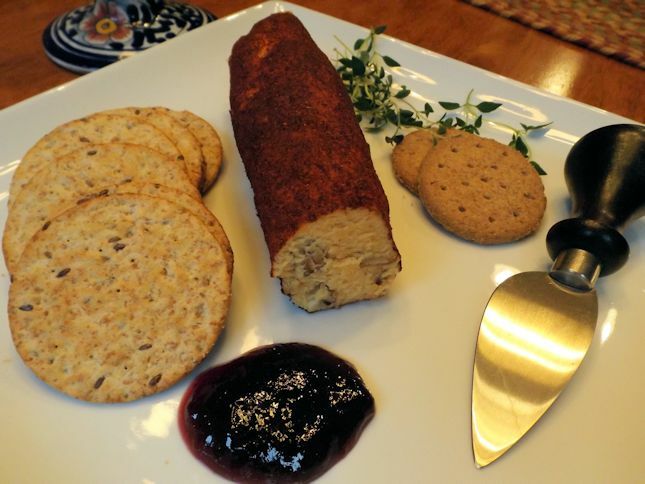 The recipe took me back to a time in the 1950’s whereupon I would meet my hubby at the door in my heels and pearls with a martini and this appetizer cheese platter. 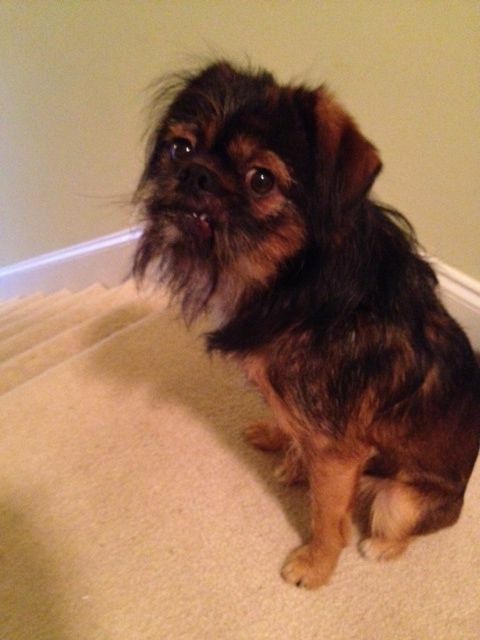 Wait again…I don’t drink martinis. This fantasy is going downhill fast. Soften cheeses to room temperature. Use a food processor to blend cheese, lemon juice, garlic and red pepper. Blend in nuts. Shape into a 1 1/2 inch roll. Sprinkle a mixture of chili powder and paprika until well coated. Add more spices if necessary. Place log in plastic wrap and chill. Allow the log to stand at room temperature for 10 minutes before serving. 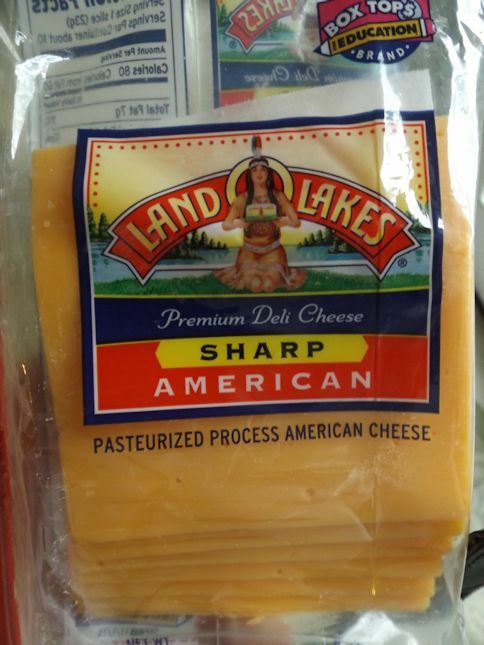 I honestly didn’t know Land-O-Lakes made something as mundane as American Cheese. You could substitute Velveeta but it won’t have the sharp taste. Don’t forget to take the paper out. Olivia can attest to the fact that food is harder to eat when your mother forgets to remove the paper when making a sandwich with sliced cheese for the lunchbox. I added some of my homemade organic blackberry jelly to the plate. I loved the combination with the sharp cheese. Admittedly not everyone else did but hey, this is my recipe box fantasy and I can mix things up a bit if I want to.